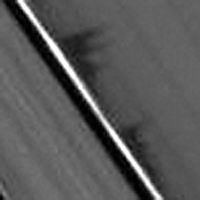 (Originally posted on June 27, 2009) Cast shadows reveal some interesting structure in the waves sent up by little Daphnis in this image, taken by the Cassini spacecraft on June 26, 2009. 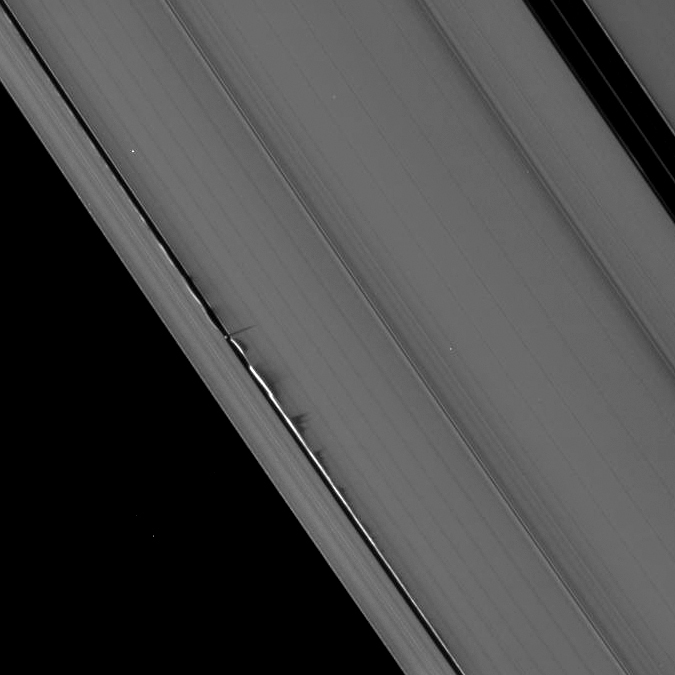 Daphnis orbits Saturn within the 26-mile-wide Keeler gap in the A ring. Its gravity disrupts the edges of the gap, carving scalloped edges in the ring material and also, as was discovered during this year’s approaching spring equinox, sends the material upwards (and probably downwards as well) in mile-high waves. The shadows cast by these waves are now visible because of Saturn’s current angle in relation to the sun. The length of the shadows indicate that the waves can rise as high as 2-3 miles above the rings. Daphnis, discovered in 2005, is just over 4 miles wide. Sharp crests and ridges in the waves are made evident by their shadows, as is what appears to be a diffuse spray of particles at the front of the second wave just behind Daphnis (the moon is moving upwards in this image). This is a raw image, received today, and has not been calibrated or validated. See more images on the Cassini imaging team site here. Every now and then I’ll be digging through my archives – now that I have a decent amount of them! – and reposting some of my particular favorites. Because it’s not just about what’s new, its about what’s still happening. Out there…in the dark.